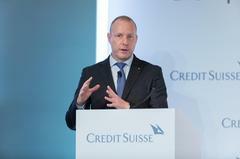 Attendees at the 22nd Credit Suisse Asian Investment Conference could be forgiven by feeling overwhelmed with granular insight, data, and analysis on everything from plastic waste to e-sports – to pick just two of the topics covered by around 150 speakers over almost 90 conference sessions, not to mention the many smaller-scale meetings and briefings over the AIC’s four days. Michael Strobaek, Global Chief Investment Officer of Credit Suisse, discusses where to find investment opportunities when disruption becomes usual. Sometimes, though, you need to sit back, “Try to turn off the screens, look at the fundamentals but also what’s going to happen in this world,” advised Michael Strobaek, Global Chief Investment Officer at Credit Suisse, in his address on Day Three. Why? Because for long-term investors especially, the day-to-day signals – even things as potentially momentous as an inversion of the 3 month and 10 year US Treasury yields – are often less significant than the megatrends that will be disrupting markets for decades. The Credit Suisse “House View” that Strobaek shapes is based around five such megatrends: Angry Societies, Infrastructure, Technology, the Silver Economy, and Millennials’ Values. Each has multiple sub-themes that, on careful analysis, will provide foundational investment opportunities. For example, the first of these – what Strobaek (in the latest issue of Credit Suisse’s Bulletin) describes as “a profound dissatisfaction and anxieties fuelled by both globalisation and rapid technological advances” – means allocations to national champions and brands, security and defence companies, and those targeting emerging market consumers are likely to pay off over the long term. Many of these megatrends and sub-themes are interlinked, of course: the reason societies are getting angrier is in some cases linked directly to the elimination of lower-skilled jobs by technology. These trends aren’t going away. Consequently, “If you’re a long-term investor, thirty to forty percent of your portfolio should be in thematic investing,” Strobaek advised. 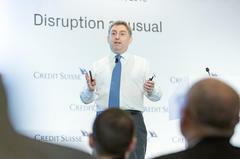 Jonathan Golub, Chief Equity Strategist, US of Credit Suisse speaks at the AIC. Jonathan Golub, Credit Suisse US Chief Equity Strategist, was another speaker who sought to join the dots between long-term trends and sound investment strategy. His message was that the inevitability of demographics – in particular, declining workforce participation and low productivity – was likely to lead to a long period of slower economic growth. This isn’t necessarily bad news for stocks, Golub argued, or at least for those companies that don’t have high operating leverage. In a low-growth environment, those with low operating leverage, i.e. services and IP-dependent businesses, could maintain earnings far more adeptly than those with high capital investment needs, such as manufacturers, and are more likely to be able to return free cashflow to equity holders through buybacks and dividends. But if it pays to lean back and look out the window every now and then before placing a buy or sell order, another takeaway from the AIC is that it also pays to look inwards sometimes. This was the fundamental lesson that Denise Shull sought to impart in her address on Day Three. Shull is an expert in the neuroscience and psychology of risk in trading and investing and a performance coach. While many investors would claim emotion plays no role in their choices, this is nonsensical, Shull argued, since “there is a plethora of research that shows every single decision you make is based on how you feel.” Those same investors would also be comfortable speaking of their confidence and conviction about the rightness (or wrongness) of certain trades. But these feelings are also emotions. With these insights, AIC attendees should be armed both to react less sharply over short-term news, and plan more strategically to take advantage of long-term trends. Doing both can only make you a better investor - regardless of how the stock ticker makes you feel.